If you have some gifting that requires shipping, you might consider taking advantage of Please Mum's free shipping offer - and Tuesday Dec. 8 is the last day for free on-time Christmas delivery! 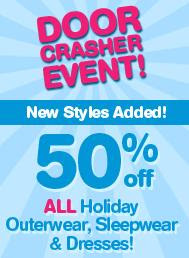 Please Mum still has ALL its holiday, outerwear, and sleepwear at 50% off. Plus, their new arrivals are now available and at special early bird prices! If you miss the on-time free shipping deadline, you can still pay extra ($15.95) and have your gift arrive on time - just order by December 15. 0 Response to "Last Day for On-Time Holiday Free Shipping at Please Mum"